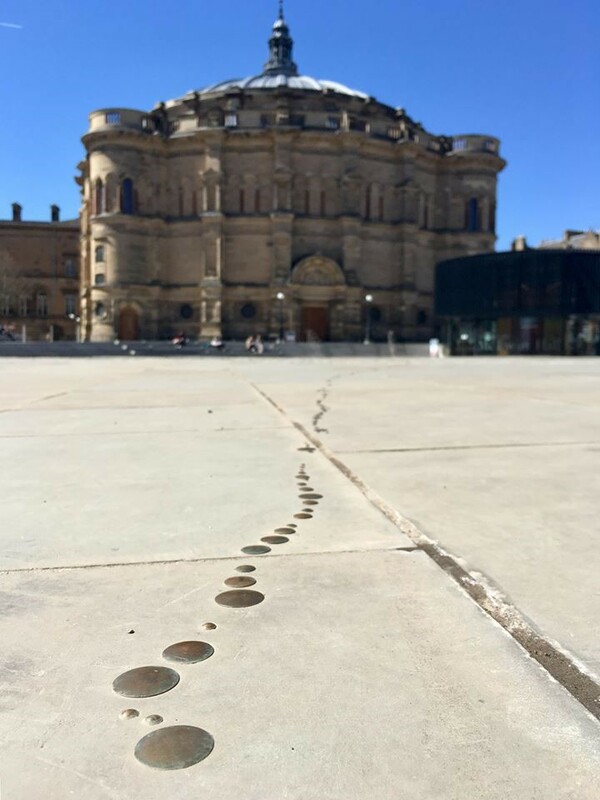 Have you ever noticed the bronze coloured drops on Bristo Square? They run from the entrance of McEwan Hall and trail off towards the other side. Maybe you have, but weren’t sure exactly what their story is? Well, neither were we. That is until we followed the library’s trail of art. 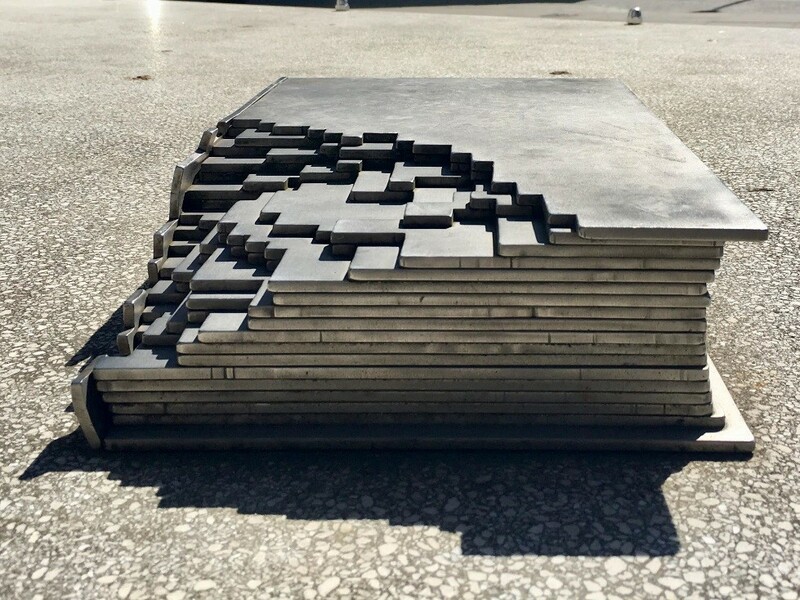 The trail consists of six artworks, all inspired by the main library’s 2017 exhibition – Shored Against Ruin: Fragments from the University Collections. By highlighting works that explore the concept of fragmentation, the trail hopes to extend the life of the exhibition beyond the gallery and blend it with the University’s surrounding environment. Here’s a little more information on three out of the six pieces you’ve no doubt come across. The Next Big Thing is a Series of Little Things (2017) is the first piece on the trail. 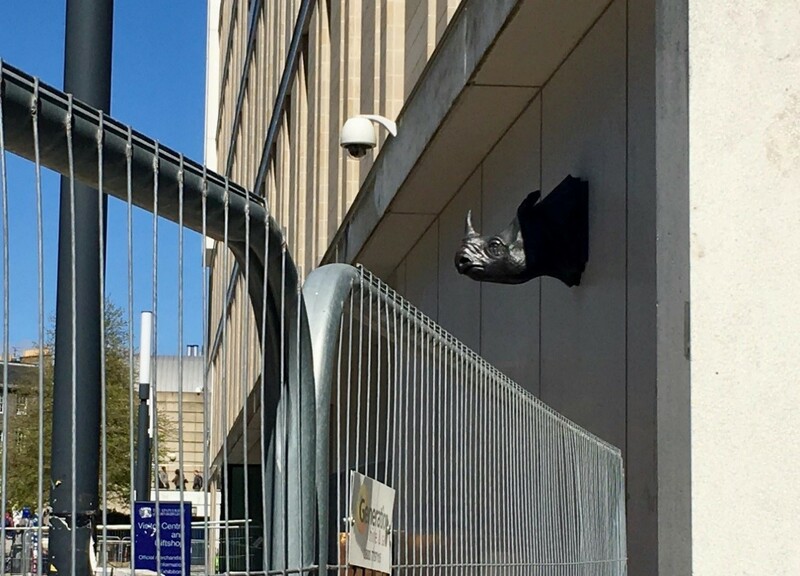 It was designed by Susan Collis, and invites visitors to follow the trail of someone who has seemingly just walked through Bristo with a leaking tin of bronze coloured paint. Deliberately unobtrusive, it adds a subtle but pretty cool artistic flourish to the revamped Square. The third piece was Alec Finlay’s Mesostic Interleaved (2009), right outside the Main Library building on George Square. Finlay’s circular poem was commissioned by the University during renovations to the library in 2010. 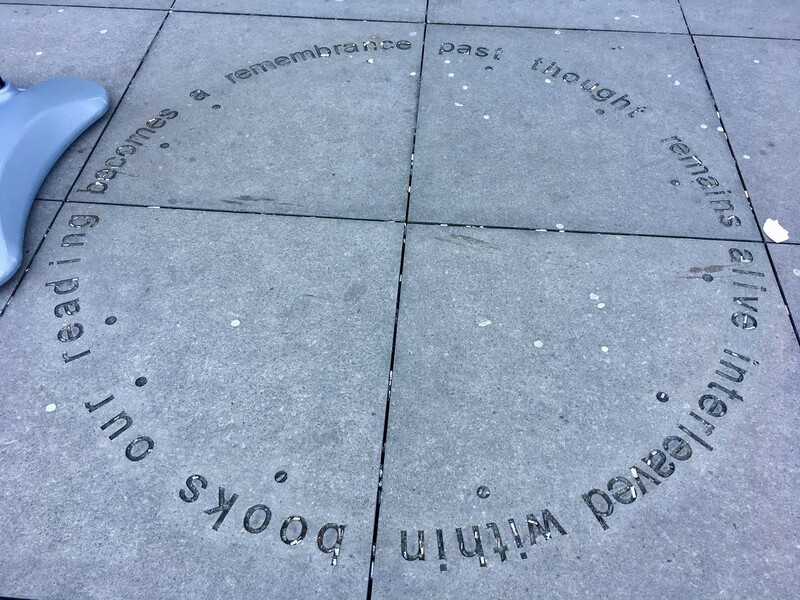 While you’ve probably walked over it thousands of times, and maybe even read it a hundred or so times, you may not have picked up on the embedded quote, “thair to remain”, signalled by the dots. This was taken from the will of the library’s first benefactor in 1580, who stated that his books were given to the library, “thair to remain” for safekeeping. Watch this space for the next three artworks on the trail! If you would like to visit these artworks and others, the university library’s Public Art Officer, Liv Laumenech, will be giving two free tours on International Museum Day – Friday 18th May. Spaces are limited (but free!) so book your tickets by 17th May to avoid disappointment. Book your ticket to the New Art on Campus Walk n Talk event on EventBrite. The University of Edinburgh’s Main Library is celebrating its 50th anniversary at George Square – where connections come alive. The library is currently creating an archive of current and former students and staff memories. Submit your memories via our website, Facebook or Twitter pages #UoElib50. Photos and videos are welcome! Check out our current memories here in our interactive timeline.